Today was another hectic day at work in the Eyeko studio! I started the day with checking our company Facebook, Twitter and emails, and replying to everything accordingly, which is easily one of my favourite parts about my work day. It’s lovely being able to talk directly to customers and bloggers, and immediately see their responses to our new launches. Then, I helped Ling – our marketing manager – to help pack up mail-outs for international press. It was a surprisingly relaxing task! I spent most of my day making up packages to celebrate our new Army and Chi Chi launches. Never in my life have I seen so much pick. Next on the list? Researching and planning for a top secret upcoming event. I finally managed to take an outfit post today, even though it is slightly boring and something I’ve worn before. Also, I only managed to snap one decent photo, so I hope you don’t mind! 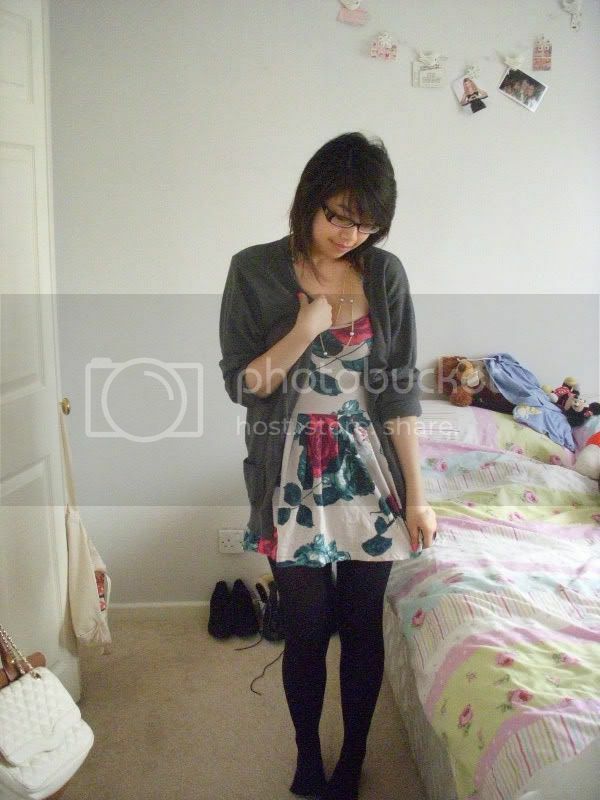 I wore my Primark floral dress, a men’s cardigan, ribbed tights (again, sorry, I forgot to take a close-up!) and right after this photo, put on my beloved new shearling boots. Just a casual outfit really, I haven’t shopped in SO long! Stay tuned for my next post, as I’ll be sharing a new intern diary entry daily! And read Day 1 and Day 2‘s entries.